By Kristy Taylor - Kristy is the Executive Director of Show Kids You Care, a national network of meal programs for kids living in poverty and other difficult situations in Canada. “This article was published on July 21st, 2015 for Food Secure Canada's Eat Think Vote campaign"
I want to tell you a story about a boy named Steven. He was trying out for track and field, and he was doing a really good job. As the tryouts ended and everyone was walking back in to the school, a teacher noticed that Steven wasn’t with the group. He stayed behind a bit, then headed over to the school’s dumpster – he looked around – made sure no one was watching – then he pulled a sandwich out of the dumpster. The teacher was heartbroken. She knew some of the kids in her school were struggling with not having enough food at home. But she had no idea that kids she worked with every day were so hungry they were hoping to find food in the school’s dumpster. Child poverty in Canada is higher now than it was 20 years ago when the federal government unanimously passed a bill to reduce child poverty by the year 2000. We have fallen so short on that goal. We know that where there’s poverty, there’s hunger. Approximately 15% of kids in Canada are struggling to have enough food at home. They’re hungry. Every day. They skip meals. They feel sick. They can’t focus in school. They’re trying to figure out where the next meal is going to come from. The weight of the world seems to be on their shoulders. I know how they feel because there was a time in my own childhood that my family went through something completely unexpected and traumatic that left us homeless – and hungry. My brothers and I would skip meals… We were so embarrassed that our family struggled to buy food. We hid our struggles from our friends and teachers. We would lie and say we forgot lunch at home, or tell people we weren’t eating because we weren’t hungry. Eventually my family stepped out of poverty (like so many families in Canada eventually do). We turned our lives around… and now I have the privilege of leading a national network of meal programs for kids living in poverty and other difficult situations in Canada. 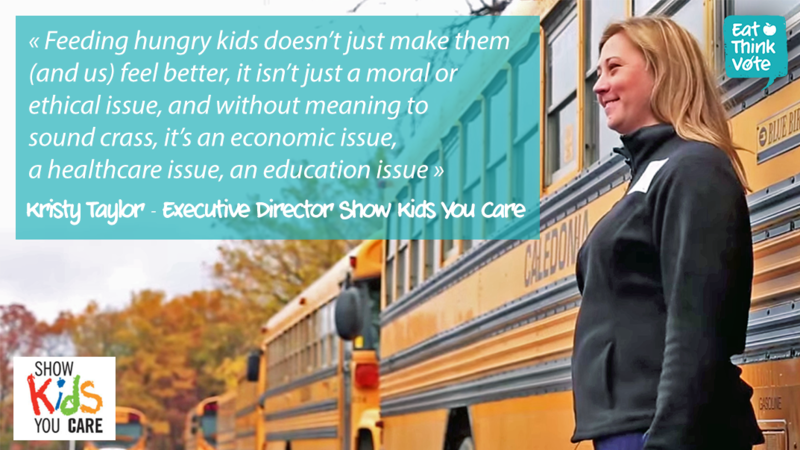 Our network is called, “Show Kids You Care”. 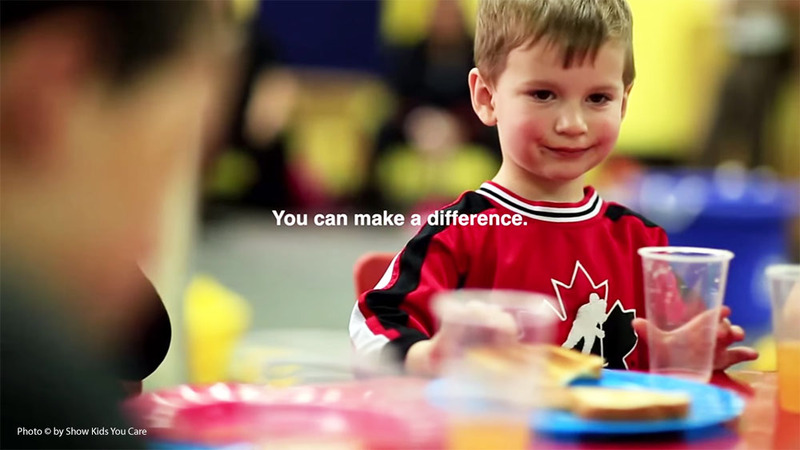 This past school year we helped provide over 18 million meals to kids right here in Canada. That number sometimes seems overwhelming, or even impressive. But it challenges me… We know we only reach 10% of the kids who need us each day. We can’t afford to help the rest of the kids who don’t have enough food at home. Sadly, the reality is that I have to turn to hungry kids each day and say, “I don’t have any food for you”. That’s one of the reasons why Show Kids You Care is partnering with Food Secure Canada to raise awareness of child hunger in Canada. More needs to be done for these kids. Feeding hungry kids doesn’t just make them (and us) feel better, it isn’t just a moral or ethical issue, it isn’t just a United Nations Declaration for the Rights of the Child issue, and without meaning to sound crass, it’s an economic issue; a healthcare issue; an education issue. Research clearly documents that when kids have access to nutritious food in their schools their grades improve, they are more likely to graduate, they achieve greater successes after they graduate. Research also shows that when we provide nutritious food to kids in schools it gives kids a sense of self-worth, it keeps them out of trouble, it teaches them to be good neighbours. We know from experience that schools with nutrition programs report that the rate of bullying is reduced once a nutrition program starts. We also know that ‘active teaching time’ in the classroom increases when kids are well-nourished and ready to learn because of the food they receive at their school nutrition program. We are also pleased to be a partner of the Coalition for Healthy School Foods. Together, this coalition is going to ask the federal government to mandate and fund meal programs for all kids in schools in Canada. 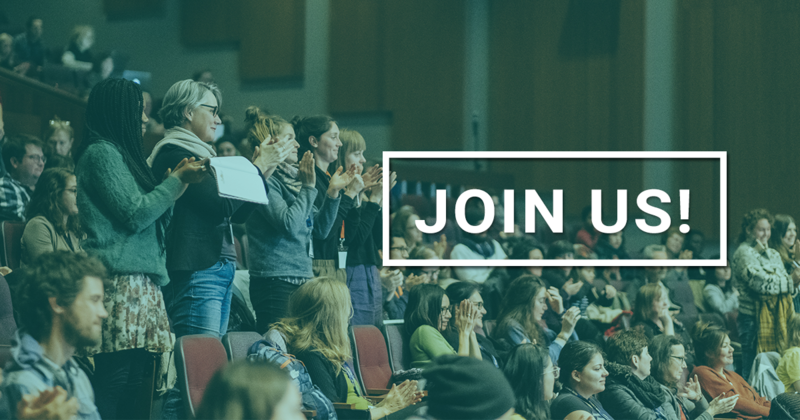 We have an existing network of programs in communities all across Canada to learn best-practices from, to build on, and to expand. We have demonstrated through our work over the past several years that we are able to find local solutions to the daily and ongoing need to provide nutritious food to hungry kids. 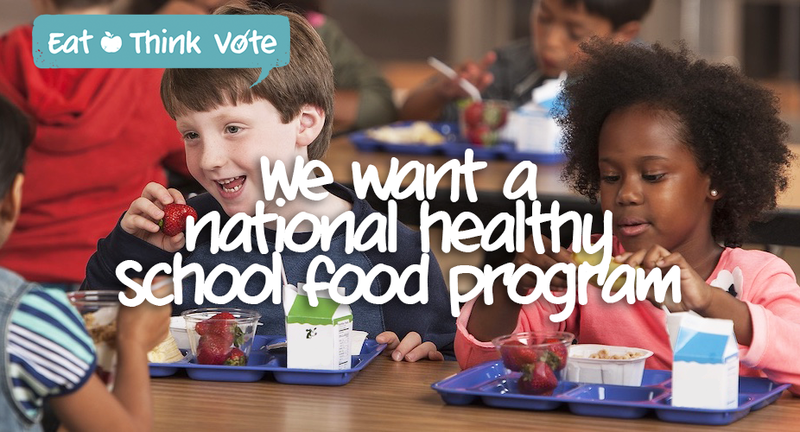 We’re asking federal candidates in ridings throughout the country to join us at our school programs in their own communities to come serve a meal, or eat with our kids, get to know why they’re hungry, and how grateful they are that we make sure they have access to nutritious food. This can’t be delayed. It can’t be the priority 4 years from now. It has to happen now. It has to be a priority right now. If you’re thinking about what you’re going to have for lunch today or make for dinner tonight, it’s clearly your own personal priority… why wouldn’t it be our collective priority to make sure kids have enough to eat? We’d love to know you support of our work. Let your voice be heard. Please sign our online petition to let federal candidates know that it’s important to you that kids have enough food to eat each day! Kids don’t often get to have their voices heard – but yours can be loud and strong – please, before you go get something to eat or get another coffee, speak up. On behalf of the kids we serve, thank you. Kristy Taylor - Kristy is the Executive Director of Show Kids You Care, a national network of meal programs for kids living in poverty and other difficult situations in Canada.